What Colors Are Trending in Interior Design? The trends in interior design are always changing. There was a time when lavish homes, with golds and silvers, were all the rage. Now, it’s all about light, minimalist designs, mismatched furniture, and travel-themed rooms. One of the biggest decisions you will make when you design or update a room is picking a color palette — from what goes on your walls and your furniture to your smaller design elements and artworks. Each should play into a cohesive palette, so the room looks thought out. To give you some inspiration, here are some colors that have made a splash with custom interior design trends this year. Thanks to the rise of mid-century design and Scandinavian minimalism, neutrals are taking on a different meaning. Instead of the usually stark blacks and whites, neutrals now include a warmer tone like brown, beige and cream. This fits perfectly with the lived in, boho approach to design that has become very popular, especially with millennial homes. Gone are the days where pink means the bright, centerpiece color. Blush is the perfect color to update the look of any room while retaining its neutral feel. It’s warm, inviting and youthful. It also goes with a lot of other neutral colors — like gray and beige — and pastels — such as mint green and powder blue. Blue, in all its hues, inspire different room designs. A distinct oceanside blue can remind you of your travels to the India or the Mediterranean. You can complement it with other striking colors, like fuchsia or yellow. A softer shade of blue is perfect for areas of relaxation, where you can unplug. Regardless, blue is a popular choice for savvy room designs. 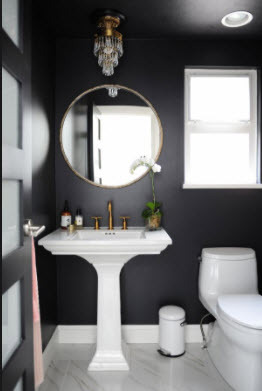 Despite the wide popularity of pastels this year and the year before, no one can deny the appeal of a black room. It’s sleek and pairs well with almost any other design elements you want to put in the room. It also adds a lot of drama to the space. If you want a room to make a statement, go black. Right up there with a predominantly black room, in terms of impact, is a red one. This year is all about picking strongly hued colors that stand out against all the pastels and neutrals. It gives a room the burst energy and character it needs. It’s perfect for risk takers who want to welcome a little warmth in their rooms.